The work of the Polish theatre director Jan Kott has been influential in Shakespeare studies, not least for the title of his collected essays, Shakespeare our Contemporary. For Kott, Shakespeare was a fellow-traveller of the mid-twentieth century, a writer who understood the political and emotional life of the modern period. Echoing Ben Jonson’s famous judgement on Shakespeare as ‘not of an age, but for all time’, Kott identified Shakespeare’s ‘modern relevance’ as his most enduring quality.1 Kott’s is a Shakespeare untrammeled by the speciics of his own period, an eternally relevant cultural property in which each successive generation can find its own resonances. We are all, according to this interpretation, Shakespeare’s contemporaries. 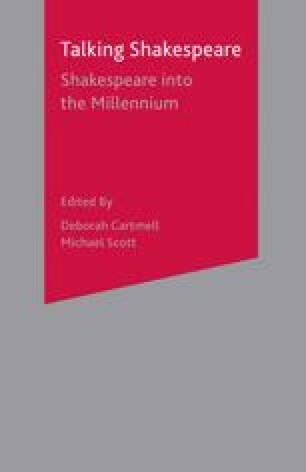 One of the practical obstacles to the project of relocating Shakespeare among his contemporaries is the relative dificulty of obtaining non-Shakespearean texts. Woodstock exists in a modernized and annotated text, edited by A. P. Rossiter (London: Chatto & Windus, 1946), and quotations in this chapter are taken from this edition. Alternatively, an electronic version of the play, entitled Thomas of Woodstock, can be obtained, free of charge for private and educational purposes, on the Internet. The Oxford Text Archive at http://irth.natcorp.ox.ac.uk/ota/public/index.shtml gives full and clear details of how to obtain the text.